A hydroponics reservoir is a crucial component of hydroponics systems. The reservoir stores the water and nutrient solution that plants require for healthy growth. It allows the nutrient solution to be actively or passively delivered to the growing plants. Hydroponics reservoirs come in all shapes and sizes and can be made out of a range of materials. They can be exclusively functional, or they can add to the aesthetics of your hydroponics system. 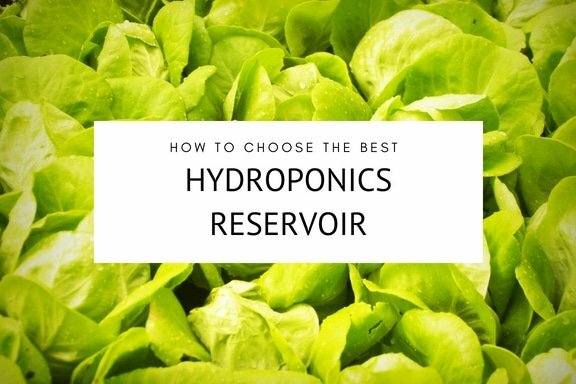 This article will discuss the factors to consider when choosing a hydroponics reservoir, as well as the common problems and how to solve them. I will also discuss some of the best options to consider when making a purchase. Is A Hydroponics Reservoir Essential? One of the main problems with hydroponics is delivering the necessary nutrients and water to your growing plants while controlling the temperature, pH, concentration and oxygenation of the nutrient solution. A reservoir provides a large volume of nutrient solution which makes controlling these variables much easier than any other option for delivering the essential nutrients and water to your plants. Pre-built hydroponics kits always come with a nutrient reservoir, as it is considered essential to make hydroponic growing a success. What Is The Role Of A Hydroponics Reservoir? There are a number of different variations of hydroponics, but in all of them, the reservoir needs to provide a constant supply of essential nutrients and water to the growing plants. The roots will either be growing directly in the reservoir, or the nutrient solution will be transported actively or passively into the container that the plants are growing in. A hydroponics nutrient reservoir provides an excellent place to prepare your nutrient solution. Ideally, you should have two reservoirs, so you can be using one and using the spare to prepare the next batch of nutrient solution prior to it being required. You can of course prepare your nutrient solution in a different container, and this will make sense for some people. In my case, it’s just easiest and most convenient to prepare my nutrient solution directly in the reservoir. Most hydroponics systems provide an abundance of water to the roots of the plants. Without constant oxygenation, the roots would struggle to obtain sufficient oxygen and the plants may struggle or die. This is particularly important in hydroponics systems where the roots are constantly covered in water, such as in deep water culture and nutrient film technique. It is normally advisable to actively oxygenate the nutrient solution. For most systems this is done with an air pump, which delivers air to an airstone in the nutrient reservoir. 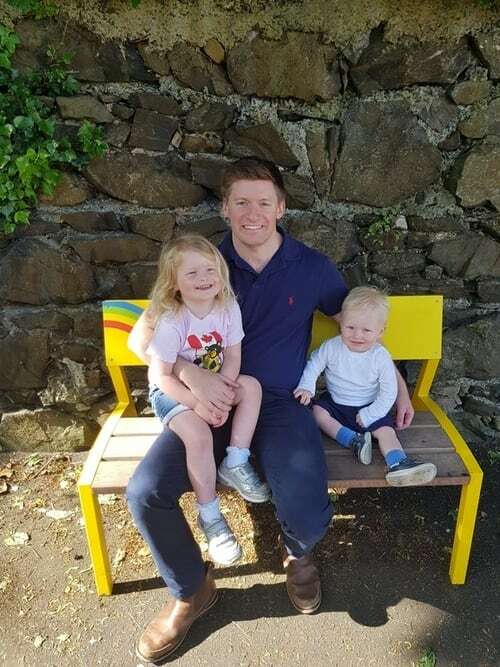 Other options include using the turbulence of falling water as it is returned to the reservoir or delivered to the growing tray to oxygenate the water. The reservoir provides a good location for most systems to complete any oxygenation that is necessary. As plants absorb water and nutrients, and evaporation occurs, the concentration of the nutrient solution will begin to deviate from the starting concentration. In the worst scenario, the nutrient solution can become excessively concentrated, leading to difficulty for roots to absorb the required nutrients and water. Most systems require periodic testing of the concentration of the nutrient solution and adjustment where necessary. Having a large nutrient reservoir reduces the rate that the concentration of the nutrient solution will change, which decreases the frequency that testing or replacing the nutrient solution is required. The concentration of the solution can be tested without negatively impacting the plants. I use a simple electronic EC meter, that gives me useful information about the changes in the solution since it was prepared. The pH of the nutrient solution can change significantly as the concentration and temperature of the solution change. Maintaining a pH suitable for your plants is crucially important for the health of hydroponic plants. The availability of minerals in the nutrient solution vary widely at different pH levels. Small changes in the pH of your nutrient solution can lead to nutrient toxicity or deficiency in your plants, due to changes in the availability of these nutrients within the solution. This is despite the contents of the nutrient solution remaining unchanged. The nutrient reservoir makes it easy to test a sample with either a pH test kit of pH meter. Again, opting for a larger reservoir will reduce the rate of change in pH of your nutrient reservoir. It will also make it easier to accurately adjust the pH of the solution, as it is very easy to over correct the solution. Maintaining your nutrient solution within a target range is very important for the health of your plants. For most systems, the best nutrient solution temperature is between 68 and 75 °F. (20-24 °C). The nutrient reservoir can help you to maintain your nutrient solution within the target range. If you live in a temperate climate or are growing your plants indoors, it may be very easy to maintain your nutrients solution at the desired temperature. However, in environments that are either much colder or much warmer than this it will be more of a challenge. Having a large nutrient tank reduces the rate at which the temperature of the nutrient solution will change. You can also buy or make an insulated nutrient tank which can help to reduce temperature changes. By taking the ambient temperature into consideration and choosing or making a suitable nutrient reservoir, you will simplify your hydroponics setup and reduce the amount of maintenance required. What Size Should My Hydroponics Reservoir Be? Generally, when considering nutrient reservoirs, I would always opt for a larger reservoir rather than a smaller reservoir. It is always easier to maintain the temperature, PH and concentration of the nutrient solution in a larger nutrient reservoir than a smaller reservoir. It is a common mistake for beginners to make that they forget that small seedlings are going to grow considerably larger. Although they will only need a small volume of nutrients solution when they are young, they will get considerably larger and need a much larger volume of nutrient solution when they are bigger plants. There is a simple guideline which can be used to choose an appropriate size of nutrient reservoir. This is based on a minimum volume of nutrient solution per plant and adjusting this depending on the size of plants that you are growing. I would consider these guidelines to be the minimum volume required, and I normally opt for a reservoir that is about double these minimum volume guidelines. Sometimes, depending on the hydroponic system that I am using, I will only partially fill the nutrient tank when the plants are small. When I change the nutrient solution every few weeks I fill the reservoir to a higher level to accommodate the plant growth. The worst thing that can happen is that you get half way through the growing phase of your plants, only to find out that your nutrient reservoir is too small. 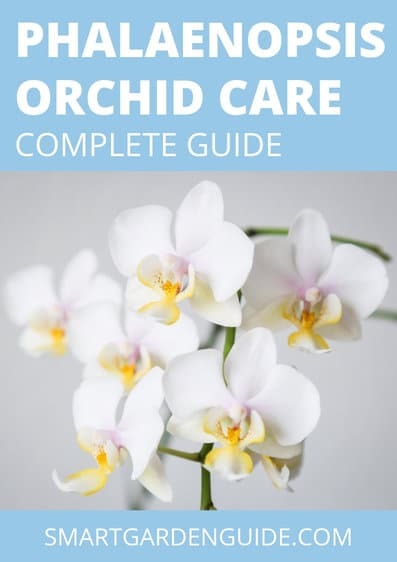 This will lead to you having to adjust the concentration, PH and temperature very frequently and your plants will suffer as a result of the variations. It is generally a good idea to put some volume markings on the inside of your nutrient reservoir. This will allow you to see at a glance how much of the nutrient solution has been used by the plants and will assist you in knowing when to replace the nutrient solution. Another useful point is to ensure that your nutrient reservoir has a lid where possible. This will largely eliminate evaporation of the nutrient solution and you can then attribute any decrease in the level of the nutrient solution to uptake and use by the plants. If your nutrient reservoir does not have a lid, evaporation will lead to an increase in the rate at which the nutrient solution concentrates and lead to more adjustment being required. 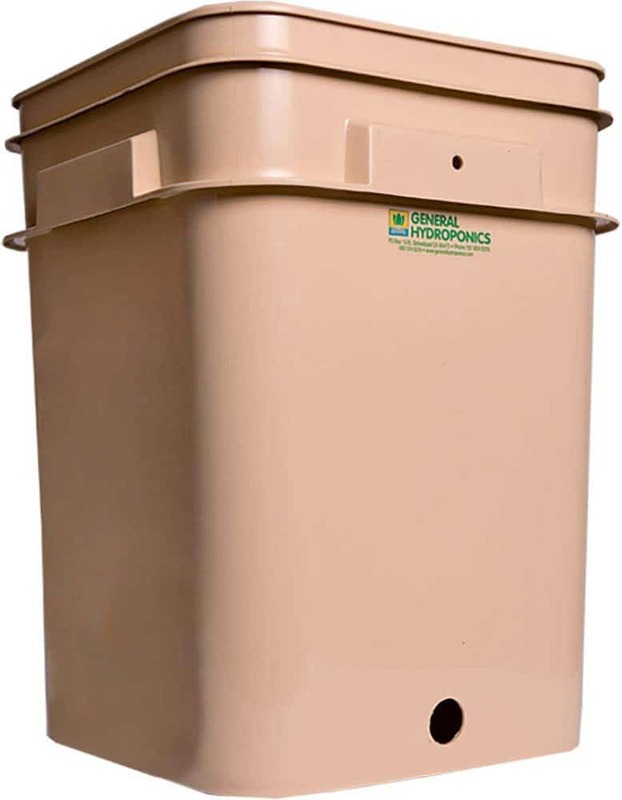 In addition, a well fitting lid on your nutrient reservoir prevents foreign material from entering the reservoir and keeps your reservoir in the dark, which limits algae growth. I would strongly advise you to choose a black or opaque nutrient tank. It should also have a black or opaque lid that is tightly fitting. The main benefit of this is that it will keep your nutrient solution dark and prevent algae from growing in the reservoir. This will reduce the frequency that you need to clean out the reservoir and will improve the health of your plants. Where To Locate Your Nutrient Reservoir? It is generally a good idea to place your nutrient reservoir in a location that is out of direct sunlight. Due to the intermittent nature of direct sunlight, this would lead to rapid changes in the temperature and pH of your nutrient solution, which would likely adversely impact the health of your plants. It is generally a good idea to place the tank close to a water source. Many nutrient reservoirs will contain a large volume of water that will need changed every few weeks and topped up every few days. It certainly wouldn’t be convenient, and often impossible to carry water a long way to the reservoir or to carry the reservoir to a water source. I would consider it fairly important to get a spare reservoir for your hydroponic system. At the very least, you should have another large container that you can prepare the next batch of nutrient solution. If you are using tap water to prepare your nutrient solution, you will need to leave the water standing in a container in direct sunlight for 2 to 3 days to allow the chlorine and chloramine to dissipate. You may also wish to run your tap water through an activated carbon filter to remove some of the dissolved solids. After this, you may need to take some time to add your nutrients and optimise the pH of the solution. Read this article to learn more about hydroponics nutrient solutions. By having a spare nutrient reservoir, you can have the next batch of nutrient solution ready to go and just swap the two reservoirs, resulting in minimal interruption for your plants. The last thing you want to do is to pick a hydroponics nutrient reservoir that will split or crack resulting in a leak of your nutrient solution. Make sure to pick a sturdy reservoir with a tightly fitting lid that won’t let you down at a crucial moment. Flushing your hydroponics system and cleaning the nutrients reservoir is an important task and should be done at least once every 3 to 4 weeks. Failure to do this, can result in a build up of debris, algae and mould in your reservoir which can spread to the roots of your plants and affect their health. Choosing a black or opaque nutrient reservoir with a tight lid will reduce the ability of mould and algae to grow and will allow you to leave longer between cleans. You should definitely choose a nutrient reservoir that will be easy to clean. Regular shaped reservoirs, with flat sides and bases provide fewer places for algae to grow and will be easier to clean. When it comes time to clean your nutrient reservoir, I normally flush water through the root system of my plants and allow this to drain into the nutrient reservoir. I then remove the reservoir and replace it with a spare nutrient reservoir which has been pre-prepared with nutrient solution. This means that there is minimal interruption to my plants and it reduces the mess that is made in the cleaning process. To clean my nutrient reservoir, I simply drain it out and then clean it with a dilute hydrogen peroxide solution and a suitable cleaning sponge. I then let the nutrient reservoir air dry, before storing it in a cupboard until I need to prepare the next batch of nutrient solution.